I feel so callous – I have zero sympathy for Wikipedia’s current and ever-lasting financial woes and even though I link to the site and use it about once a week if not more, I can’t bring myself to donate. Why? 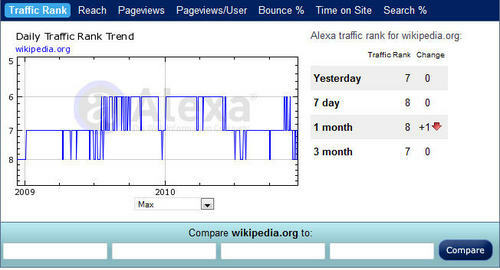 Well perhaps it is because I know people who were let go from a paid encyclopedia site. Yes, paid encyclopedia site – sounds so yesterday. Believe it or not I was one of those kids who used to have a bookshelf of written encyclopedias in his house and yes, I understand it takes hundreds or thousands of people to assemble a solid encyclopedia and keep it up to date, objective and free of errors. And it may be old fashioned – but I understand these people who contribute deserve remuneration (this is how Wikipedia defines it). Yet another old-fashioned concept when so much on the Net is fee. 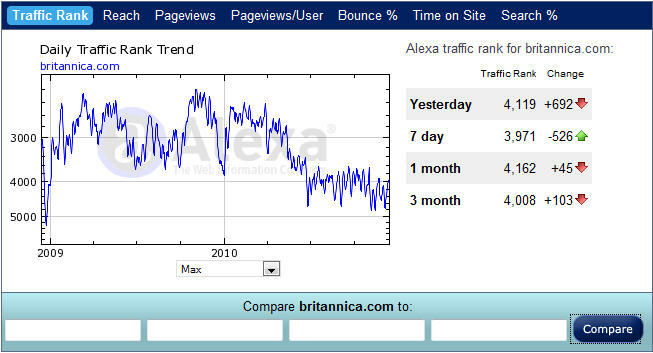 Encyclopedia Britannica ranks in the top 4,000 sites in the word - still good but they get much lower traffic as sites close to #1 receive exponentially more traffic. So although I would argue this new and open encyclopedia is better in some ways than what existed beforehand, I don’t think I will be spending my money to support it. And it is pathetic that the requests for donations keep getting bigger and bigger on the site. Apparently, they are millions below their fund raising goal. I am not sure if others agree with me but I sense my feeling is common as evidenced by the lack of fundraising success. The obvious answer is to just display ads. 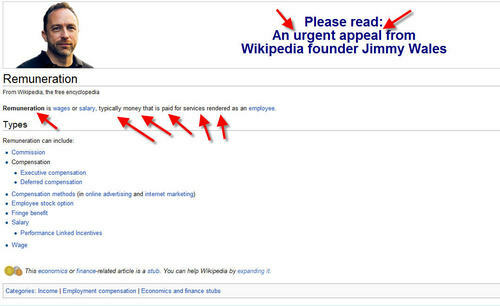 I consider Wikipedia to be a valuable service – and it would be a shame to see it go. But if it were to disappear it would be replaced by something – perhaps Google Knol or Facebook or Twitter will come up with something. Anyone remember Microsoft Encarta? I just hope the situation gets resolved soon because I am half-seriously thinking of posting the photo appeal portion of the ad above under the Wikipedia entry for torture.